The 49ers will not pick up the option on the final two years of nose guard Earl Mitchell’s contract, Eric Branch of the San Francisco Chronicle reports. 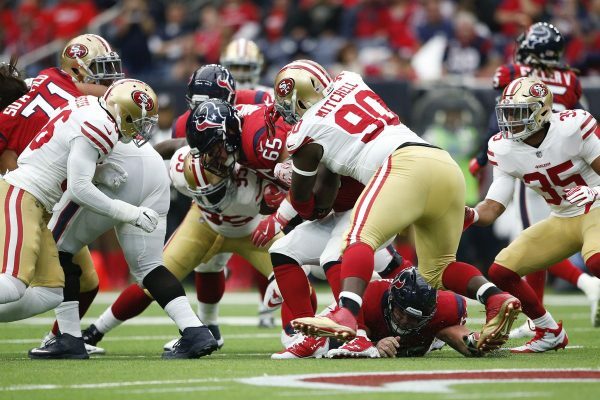 Mitchell started 28 consecutive games for the 49ers after signing a four-year for the 49ers after signing a four-year contract last year. In 2018, he was a key part of a defense that ranked 14th in rushing yards allowed (113.4), seventh in yards per attempt (4.1) and allowed one 100-yard rusher in his 12 starts. Be the first to comment on "49ers Won’t Pick Up Option on Final Two Years for Nose Guard Earl Mitchell"